I (we) look forward to attending! I cannot attend but would like to support Lone Star Lyric. 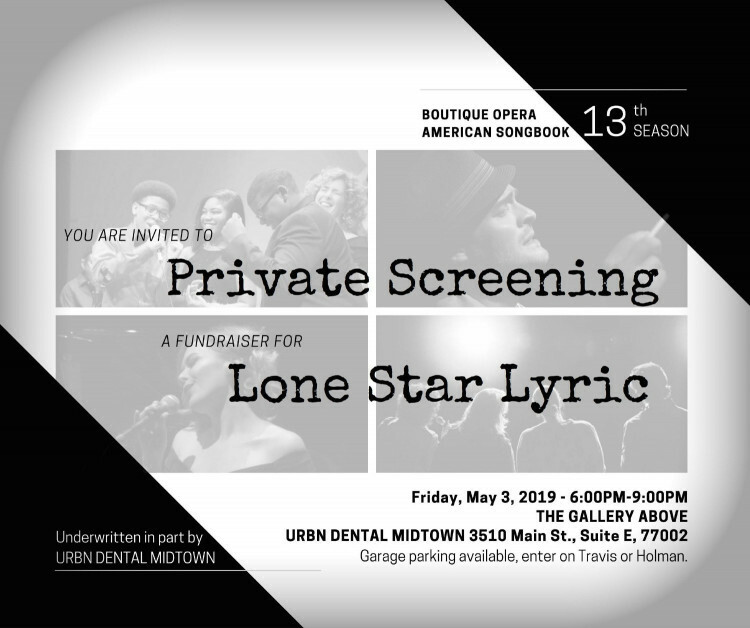 “Private Screening” will be an evening of favorites – your favorite movie musicals and our favorite Lone Star Lyric shows. Enjoy clips from vintage LSL cabarets and summer lyric productions. Tell us your top movie musicals (Facebook or email) and we will sing them live! But what would a “Private Screening” be without a trailer for our 2019 summer events? Meet the artists who make it all happen in the only way Lone Star Lyric knows… up close and personal. Your support will help LSL continue providing its diverse lyric theater experiences and innovative productions while proudly featuring Houston’s finest opera and theater performers, singers, musicians and theater professionals at the newest theater in town - the MATCH. Vote for your favorite Movie Music Maker - Hear the results live May 3. Please respond by May 1, 2019. No tickets will be mailed. LSL is a 501(c)(3) non-profit organization.